We are retired and have moved from a single family home to Haywood Reserve. It has been the best transition anyone could ask for. The staff is very special and Roland the manager is the best! Dennis D., we strive for 100% satisfaction, and it is great to see you had such a positive experience at Haywood Reserve. It’s been great living here. I enjoy the monthly community events (especially when food is involved). And the staff have been quick to respond to issues. I am confused however by the sudden increase in the monthly maintenance fee. Hi Hwi Eun H., thank you so much for your positive comments about Haywood Reserve! Would you also mind giving us a call about your question with a monthly maintenance fee. 864-288-5531 Thank you! Great apartments; great people with whom to work. Love my huge kitchen and my spacious bathrooms and the activities. We have great things to do each month. 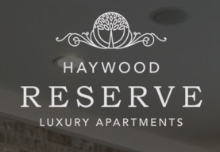 Hi Catherine Price W., thank you so much for your positive comments about Haywood Reserve! Absolutely love the beautiful community here at Haywood Reserve! Awesome amenities and great friendly staff! Love how pet friendly it is! Highly recommend! Hi Jordan Ann J., we are very happy to have provided you with such a positive experience! Good place to live, no major noises sometimes you hear the dogs at night. Needs better maintainance in the hallways and common areas (lots of spider webs and spiders). Everyone is so awesome in the office! I am here now for over one month and I feel home. The environment is just perfect and clean! I love it here! So far so good! Really impressed with the community and the facilities ... Haywood reserve is the place to be. Keen to spend more time getting to know the people around the complex! I love this apartment community and I appreciate that there are three community events per month. It has opened my eyes to a lot that Greenville has to offer. The office is very responsive and the community is well managed. The only negative is that the complex isn't closer to downtown. We have only been here for a few days, bit our experience so far has been smooth sailing! The amentities are great, our apartment is spacious with lots of storage space, and the entire community is super pet friendly. We love it so far! I absolutely love it at Haywood Reserve Apartments! Very nice clean apartments and a beautiful community with lots of great features! I would highly recommend it! I have not even moved in yet but I still feel like I am apart of the family already. This place is amazing and I would recommend anyone to stay here. We've really enjoyed the property, it's very clean and quiet. The pool and gym are pretty nice, lots of machines and free weights. The care team is great. I really like living here so far. The people in the office are really nice and helpful. The apartment is beautiful and I haven't had any surprise maintenance visits, which was a huge problem at my last apartment. The workers would knock once and then let themselves in. It was terrible. Thank you for being respectful of my privacy. Great apartment, great amenities, fix things very promptly! Ive lived in greenville for about 2 years now...Best apartment I've lived in while living in Greenville. Love Love Love the environment, amenities and my pleasant neighbors! Haywood Reserve is focused on community and makes valiant efforts to lead in bringing us together. What more can you ask for? Nothing! We love living here in this apartment complex. Facility is very friendly and stylish, neighborhood is very nice. Management & Staff: Highly professional, well trained. Beautiful, very spacious apartmentment with fantastic ammenetities and a quiet and peaceful neighborhood. We’ve only been here for a month and are absolutely loving it so far! We haven't even moved in yet, but got a very good feeling about this place. Everyone was so friendly. The place is absolutely beautiful. Very excited! Positive expirience, gym and pool made this place attractive. Good floor plans and quality building structure helped me did not hear my neighbors. I love my apartment. The people are nice. It is easy to get to downtown,Woodruff Rd,mall and restaurants. The office people are great. The pool is nice to relax, meet up with othe people here or bring friends. Very dog friendly! Excellent facilities, helpful and welcoming staff and outstanding maintenance team. It's been a pleasure living here for the past year and a half. I would strongly recommend anyone looking for accommodation to consider Haywood Reserve! The apartments, amenities and community cleanliness are incredible and the people are even better. Love living here as a young professional. Close to work, restaurants, bars and anything you'd ever need.